I see some value here in the total on Tuesday’s highly anticipated Opening Night matchup between the Celtics and Cavaliers. Not only did these two teams face off in the Eastern Conference Finals last year, they made a blockbuster trade in the offseason. Cleveland traded Kyrie Irving to Boston for Isaiah Thomas and Jae Crowder. A deal that was sparked by Irving’s demand to be traded. LeBron James and the rest of the Cavaliers who have been with the team took that trade personal, as Irving basically said he didn’t want to play with them anymore. Needless to say, this is one of the rare times you get a playoff type atmosphere in October. Both teams will be out to make a statement. I look for that intensity to result in a much lower-scoring game than the number the books have set for this total. Keep in mind there’s a lot of new faces on both teams and there’s just not going to be that chemistry. Cleveland has 3 new starters in Derrick Rose, Dwayne Wade and Crowder. 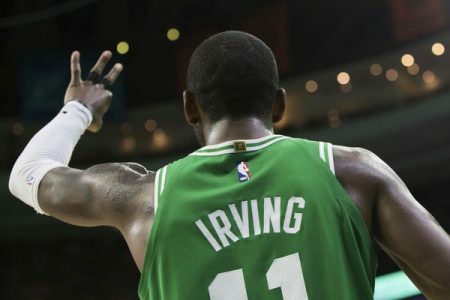 Boston has two new faces in Irving and Gordon Hayward, plus will be without expected starting power forward Marcus Morris, who figures to be out another week or so with a knee injury. James is questionable for the Cavs, but I fully expect him to play. If he doesn’t, that only adds more value to this one going below the mark. Take the UNDER! Jimmy Boyd wants to help you destroy your bookie and bring home some serious cash with Boyd’s Monday All-Inclusive 2-Pack! Both plays are yours for the low price of $59.97 **BEST VALUE**. On top of that you are GUARANTEED TO PROFIT or you will get Jimmy’s next premium card at absolutely no cost!